Since Oracle’s acquisition of MySQL I am sceptical of using MySQL as my default Open Source database so I have started using PostGreSQL over mySQL. Go to https://jdbc.postgresql.org/download.html to download the required driver for yourself. Since I installed the latest version of PostgreSQL so I download version 42.1.1 the latest version at the time of writing this blog post. Include the dependency in the gradle build file. With my little understanding of gradle this was the most time consuming part as I could not find the correct syntax to include the PostgreSQL dependency in the gradle build file. in your gradle build file. That’s it, once you have performed the above actions, your project should now complete and use PostgreSQL as the database server, please note that I came across the following few error messages, so I thought it might be good to mention them here. This just means that the compiler is not able to find the jar file for the jdbc driver. 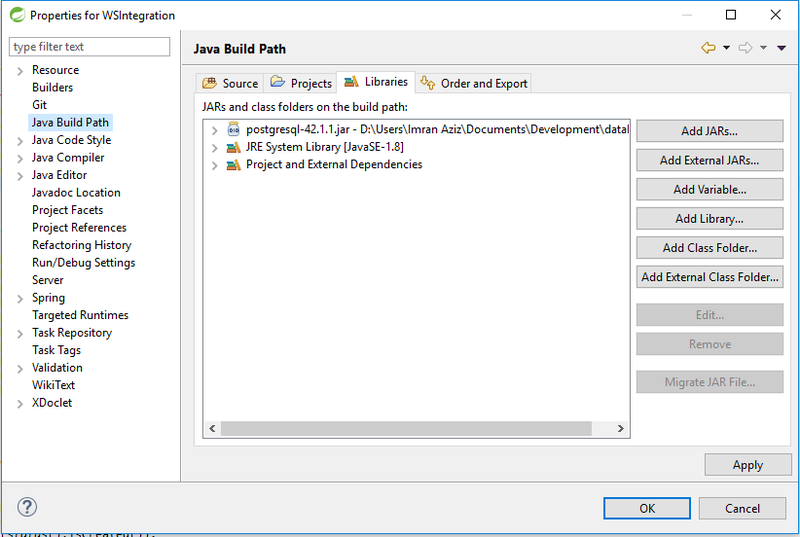 Make sure you have downloaded the jdbc driver and placed it in the project class path. Desc is a reserved word in PostgreSQL server so make sure that you are not using any database fields that are reserved for the specific database server. This entry was posted in java and tagged Gradle, PostgreSQL, Spring Boot by Imran Aziz. Bookmark the permalink.